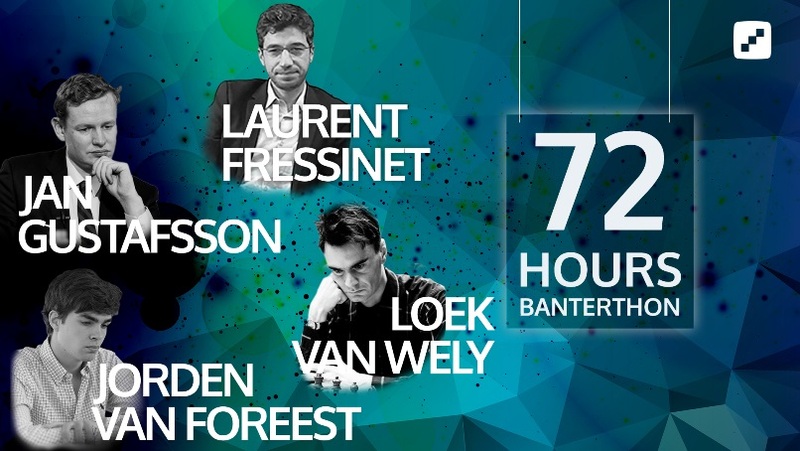 Loek van Wely, Laurent Fressinet, Jan Gustafsson and Jorden van Foreest will team up from Sunday onwards to stream 72 hours of non-stop blitz against chess24 Premium members. The action starts at noon local time in Hamburg, Germany, with Jan promising, “72 hours of more or less non-stop talking nonsense”. There’s never been a better chance to play against a chess grandmaster – or to beat one! Our heroes may have won 11 national titles between them, but will they be at their best at 3am on a Monday morning? When is the Banterthon happening? Our grandmasters need little introduction. Loek van Wely is an 8-time Dutch Champion and a player who reached the world Top 10. He’s going to stick around in Hamburg after the Banterthon to record another chess24 video series, and if you haven’t seen it yet you should check out his 5-hour Loek’s Endgame Strategy. Loek filmed that series together with German no. 2 Jan Gustafsson, whose claims to fame include winning the European Team Championship and the Bangkok Chess Club Open, as well as seconding World Champion Magnus Carlsen. In that role he was joined by 2-time French Champion and our next Banterthon star Laurent Fressinet. 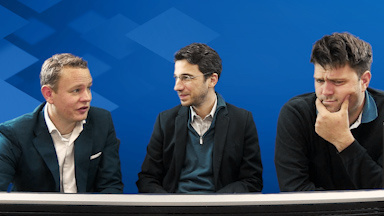 Together with Peter Heine Nielsen they provided us with Inside the 2018 World Championship Match, “the best treatment of the Carlsen-Caruana match, and by some distance” (John Hartmann, review in the February 2019 issue of Chess Life). 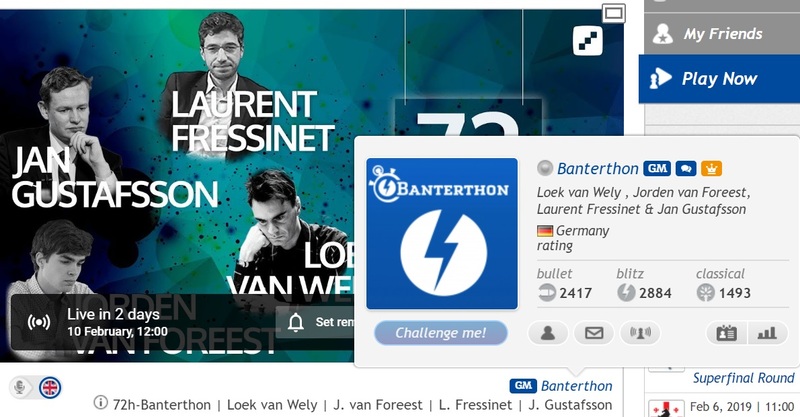 Loek’s current rating is 2622, four points higher than our final Banterthon player, Jorden van Foreest. Jorden won the Dutch Championship as a 17-year-old and now at 19 beat Jan-Krzysztof Duda, Vladimir Fedoseev and Ian Nepomniachtchi in his recent debut in the Tata Steel Masters. He drew only 3 of 13 games there and can be relied upon to play some entertaining chess. How do I take part in the Banterthon? If you’re not yet a member you can Go Premium here – as well as the chance to play grandmaster you get unlimited access to hundreds of hours of exclusive videos, unlimited Tactics Trainer puzzles, cloud analysis tools and much more. So all that remains to say is… don’t miss the show from this Sunday onwards!